I was surfing Minkara a few months back (it’s August 2017) and I came upon a page named “M30 @ HI”. 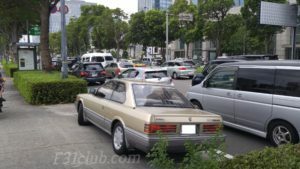 The owner took pictures of a stock beige M30 with Hawaiian background. I sent Mark the pictures to see if he knows the person. He said he doesn’t know them. 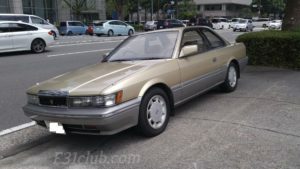 On July 4th, Mark called me and said he has the person who has that beige M30 at his house. Mark said he got a call and talked to Allen (Satoshi-san’s friend) and they wanted to meet with Mark. During that meeting, Mark asked many questions and there was a great exchange of culture and information. Mark is doing a write up on the meeting. Anyways, I told Satoshi-san I would like to meet him in Yokohama if possible during my August 2017 trip. We scheduled to meet up and even though it was a short time, we talked leopard and M30, traveling and idea exchanges. 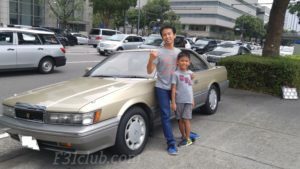 Satoshi-san said he’d meet Jacob and I outside of East exit Police box near Yokohama station. 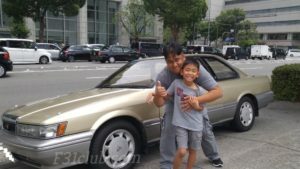 He picked us up in his Gold Zenki! It was clean and very nice. Satoshi-san took us to a light house, for lunch and dropped us off near the Yokohama Landmark Tower. Thank you for your time my friend! This entry was posted in Meetings, opinion, Owners.